You can see that this is not a large movement and the boot restricts it somewhat - this is why even some pros believe the ankle can't do much. It is however enough to put sufficient pressure on the side and bottom of the boot and tip the entire thing, by applying torque on the side of the sole and the sidewall of the boot, especially efficient when the foot is unweighted. Expert skiers and all good skiers pay attention to separate the upper body from the lower body and control edging with the lower body (i.e. feet and ankles) via foot tipping. This is perhaps most obvious as we look at angulation vs tipping, below. This is the reason why it's not good to focus on angulation as creating edge angles. The more efficient view is that foot tipping controls the ski edge angle while angulation complements that for balance and to allow bigger edge angles. 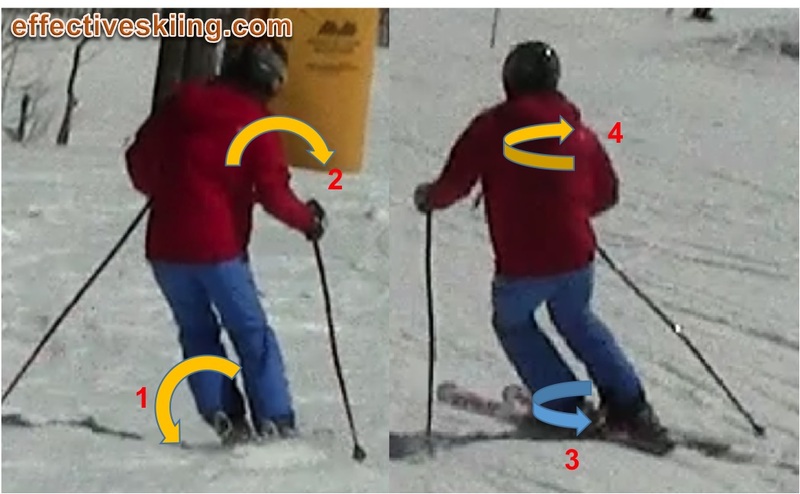 This makes a difference when selecting the right language to describe what the skier should do and feedback: the actual movement that the skier should do is eversion. 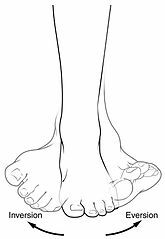 Over or under pronation are best addressed with a custom footbed design. The ankle/foot are in "open chain" when they are free to move, i.e. no weight/pressure is present (unweighted). Conversely, they are in "closed chain" mode when weight/pressure is present, against the snow. The different modes have somewhat different bio-mechanics and ranges of motion as well as they recruit different muscles. It is easier to invert/evert the foot in open chain - i.e. unweighted - in the sense that it has a bigger effect on tipping the skis on edge. When the foot is weighted, tipping it on edge is harder, see Extension kills tipping. You can see that it would be typical for inversion to be done in open chain - i.e. we don't ever put a big weight on the inside ski, while the eversion is harder to do, since it's done with the outside foot, which is generally weighted. Also, from an open chain vs closed chain perspective, there would be a difference in tipping the skis while unweighted in transition versus while pressured at the apex and the end of the turn. Viewed 6355 times ( | Print ) this page.